Abstracts will be divided into the designated categories for review and program purposes. Presenters should select one topic only. APTHC 2018 Best Poster Award is supported by MDPI (Multidisciplinary Digital Publishing Institute). The awardee will receive a grant of USD 300. The award will be selected by the Scientific Program Committee and will be announced on the website. All abstracts must be submitted online via the conference website only. Abstracts submitted by fax, email, or post will NOT be accepted. 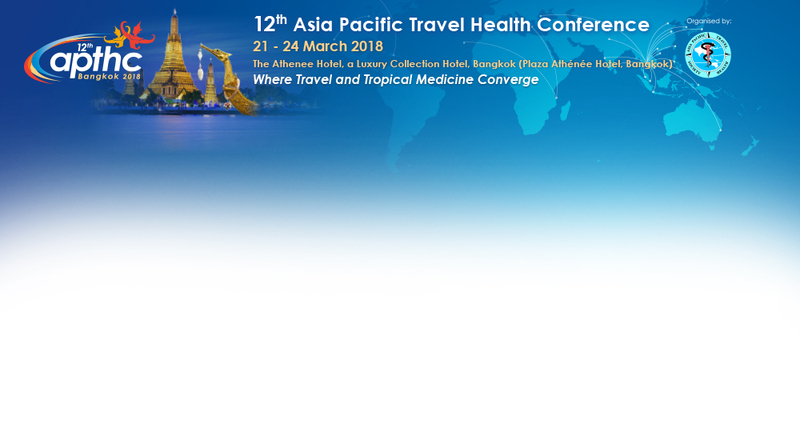 In submitting the abstract, the author grants the Organizers of 12th Asia Pacific Travel Health Conference (APTHC 2018) the right to publish the abstract both in hard and electronic forms. All abstracts must be submitted on or before 17 January 2018. The online submission system will be closed at 24:00 hours (UCT/GMT +8hrs), 17 January 2018. All abstracts submitted after the deadline will not be accepted. Notice of acceptance/rejection will be sent via email to the corresponding authors on or before 14 February 2018. If the abstract is accepted, author will have until 22 February 2018 to register for the conference. All selected presenters who are not registered by this date will not be included in the conference materials. Abstracts will be selected for either oral or poster presentation. Please select your preferred mode of presentation when submitting your abstract. Abstract must be limited to 300 words and must be concise and clear, highlighting the most relevant aspects, findings and conclusions. The word limit for the abstract title is 25. A maximum of 2 images can be attached and in jpeg format only.